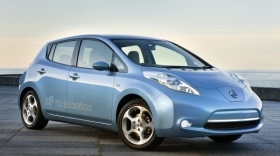 The Leaf, shown, isn't a car for "zealots," says Nissan-Renault CEO Carlos Ghosn. YOKOHAMA, Japan (Reuters) -- Nissan Motor Co. made its first electric vehicle, the lead acid battery-powered Tama, in 1947 and now with the launch of the Leaf, the company is the first automaker to begin producing a mass-marketed EV. The five-seater Leaf hatchback is expected to cost just under 3 million yen after subsidies in Japan, and about $20-$25,000 in the U.S. In comparison, General Motors' Volt, a plug-in hybrid that will compete with the Leaf, will be about $41,000. But what Nissan and its French partner Renault SA are doing is something no other automaker has attempted before: getting governments and infrastructure providers involved on a global scale from the start, to create, for the first time ever, a sizeable market for zero-emission vehicles. The automobile industry has long vacillated about what the ultimate green car would be. After collectively giving up on marketing EVs in the last decade due to prohibitive costs and shoddy battery technology, major automakers such as General Motors, Toyota and Honda became convinced that fuel-cell vehicles, which run on hydrogen fuel, could be the winner. But the prohibitavely high price of the cars didn't help. With little hope of selling them in significant numbers, the infrastructure for hydrogen fuelling stations that automakers waited for never came. Fuel-cell vehicles were put back in the garage. As the top carmakers in the U.S. market eventually abandoned the EV experiment that had been ignited by California's Zero Emission Vehicle mandate in the early 1990s, the main culprit was the cost and performance of the batteries. Storing and discharging energy at the rigorous pace and frequency required in a moving vehicle was a technically formidable task. Toyota knew that all too well. It had to recall all of its first-generation Prius hybrid cars for battery failure. But with 18 years of advanced battery development behind it, Nissan had a long lead, engineers and executives said. Japan's oldest car company had begun working on lithium-ion batteries, considered the best match for rechargeable cars today, before any other automaker, in 1992. It has also brought development of the electric motor and inverter, the two other key EV components, in-house. Many people may be surprised by the coming green car revolution. Nissan is not the first to roll out electric vehicles, which plug into an electric outlet to charge the battery and have an electric motor instead of an internal combustion engine. Mitsubishi Motor Co. came out last year with the egg-shaped i-MiEV, while niche newcomer Tesla Motors Inc. put its Roadster hot-rod out in 2008. But sales of those cars are still in the thousands. To enter the mainstream, the Leaf had to be on the shopping list of the average buyer, and not just the "eco warriors" that would buy a zero-emission car at any cost. This isn't a car for "zealots," a term Nissan-Renault CEO Carlos Ghosn often uses to describe owners of other EV niche models, such as the Tesla. Nissan says the central concept for the Leaf was to make it seem like a "normal" car, right down to the faint but audible humming sound that engineers programmed into it to make sure pedestrians hear the car approaching at low speeds. But, after all that, Nissan and Renault still face one of the biggest challenges to ensure EVs can go from niche to mainstream: significant cost reductions on lithium-ion batteries. Automakers will rely heavily on subsidies and tax breaks to sell EVs at the start. As the numbers grow, governments will inevitably be forced to cut back. "It's been a constant worry since the beginning," said Thomas Orsini, head of zero-emission business strategy at Renault. "This is why it was important for us to understand how committed each government is, and to make sure that this kind of commitment is sustainable (against) the constraints on public finances." Japan, for one, has yet to decide whether or by how much it will extend subsidies on EVs beyond March. Without them, the Leaf would cost 3.76 million yen, not far from Nissan's top-of-the-line Fuga sedan. "The guys are working on what we call BCR right now -- Big Cost Reductions," said Andy Palmer, head of Nissan's Zero Emission Business Unit. Unless it keeps a competitive price -- with or without subsidies -- Nissan risks losing out to other technologies. Toyota, for one, is looking to steal the Leaf's thunder with plug-in hybrids, which marry a hybrid with an EV. Plug-in hybrids have the advantage of being rechargeable to enable driving on pure electric mode for short distances; the gasoline engine kicks in once the juice runs out, taking care of any range anxiety. Toyota said last month it would price its first plug-in hybrid, based on the Prius, as low as 3 million yen in Japan without subsidies. A survey by consultancy Deloitte Tohmatsu found just 27 percent of U.S. consumers willing to pay more than $35,000 for an EV. In Japan, only 12 percent said they would spend more than 3 million yen. Renault's different pricing model, whereby customers buy the car and rent the battery, will appeal to customers conscious of the initial outlay, said Thierry Koskas, head of Renault's EV project. Renault's Fluence electric car, due to go on sale in September 2011, will cost 21,300 euros, but drivers will hire a battery for 79 euros per month. "As we have the alliance we can experience different sales methods," Koskas said. The alliance is well aware that the total cost of owning an electric car is going to be the biggest factor for most people on whether they buy one. "We always knew that getting eco-warriors and early adopters was going to be the easy part of the job," Palmer said. To avoid the mistakes of the past, Nissan and Renault knew industry, policymakers and infrastructure providers had to move in tandem. And for that to happen, all the players needed to be sure that EVs were technologically and commercially ready for the road. "It's the chicken and egg argument," said Hideaki Watanabe, who heads the Zero Emission Business Unit for the alliance. "Are we going to wait for the infrastructure to be ready, or are we going to drive the speed of infrastructure by putting a product out there? Which is more proactive as a company?" Once sold on Nissan's technological readiness, many governments were swift to come on board as partners. "The main concern of the partners is, 'Okay we would be ready to invest in infrastructure or whatever but tell us about the cars,'" said Koskas. Officials on both sides of Nissan and Portugal's conversation in the spring of 2008 remember how quickly they agreed as they sat down to talk in the coastal Portuguese town of Cascais. "I knew that the moment we had the chance to talk about this, something good would happen, because our objectives were so aligned," Joao Dias, economic adviser for Portuguese Prime Minister Jose Socrates, told Reuters. Portugal gets more than 40 percent of its electricity from renewable sources, among the highest in the world. By 2020, it wants to raise that to 60 percent, and for that electricity to power one in every 10 cars on the road by that time. It plans to put up 1,300 normal charging points and 50 fast-speed ones in 25 cities in its pilot phase by next July. The government will also offer a 5,000 euro subsidy for the first 5,000 buyers of electric cars, lowering the price for consumers to under 30,000 euros. The partnership with Portugal is just one of many example: by the end of 2008, the alliance had 10 agreements, from Israel to Oregon. The number doubled the next year, before ballooning to more than 80 today. Not satisfied with the nearly 40 miles per gallon she gets on her gasoline-engine Smart car, Laura Spanjian put down her $99 refundable deposit sight unseen to get in line to buy a Nissan Leaf. As Director of Sustainability in Houston, Texas, Spanjian is doing everything to prepare a city that is home to 5,000 energy firms and known as "Oil Capital of the World" for a variety of green initiatives, including electric cars. Houston is setting up 65 electric charging stations by early next year and is making it easier for buyers to get permits to set up charging spots in their garages. "I literally spend $40 a month on gas, which is just unbelievable. But it still runs on gas. I really want my electric car."